Hell DVD Review Hell is dark science fiction about survival in the worst type of conditions and the lengths people will go for their survival. It’s a solid little effort, but it feels like a retread of previous material without much of it’s own original flair. The year is 2016. Solar flares have destroyed the Earth’s atmosphere and over four years the temperature has risen by 10 degrees Celsius, turning the entire world into a barren wasteland. In this new post apocalyptic dystopia, a group of survivors; Phillip (Lars Eidinger), Marie (Hannah Herzsprung) and her younger sister Leonie (Lisa Vicari) head towards the mountains where they hope to find a plentiful water supply. On their way, they come to a gas station and while searching for supplies, they are attacked by Tom (Stipe Erceg). After subduing him and then giving up gas and fixing their car, Phillip offers Tom the chance to go with them, which he accepts. Together they continue their journey to the mountains where they encounter group of survivors who are not what they seem. 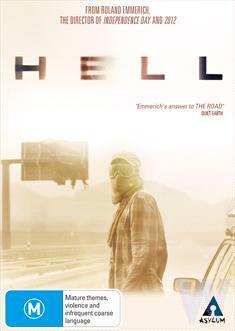 Hell is a nice film to look at. Due to it’s subject matter, it’s very stark and overbearing, like the Sun that has scorched the planet. The visuals are a big aspect of the film and the world is created beautifully, as you imagine a burnt and barren planet would. The cast do a good job with their material, but I found my attention lagging through the film. The first 20 minutes had me pulled in, but after that my attention began to waver. I just felt I had seen this same story before, but done better. Hell is pretty much a German version of The Road. Where that film was dark, cold and gloomy, this one is bright, hot and overbearing, though the story is essentially the same. Produced by German Director; Roland Emmerich (Independence Day, The Day after Tomorrow, 2012), it’s fitting that a man who directed several films about apocalyptic events that led to the end of the world, that he would help produce a post apocalyptic film, after the end of the world, in his native Germany. I could easily see a remake, with an American director taking the material and adding a Hollywood effort to it, with a little more depth and a lot more bang bang, but who knows. Could happen, right? Hell is dark science fiction about survival in the worst type of conditions and the lengths people will go for their survival. It’s a solid little effort, but it feels like a retread of previous material without much of it’s own original flair.